The Dairy, Lodge Farm01263 715779work01603 870304fax Self-cateringThe Dairy, a converted barn on one level, is situated in the extensive grounds of Lodge Farm, a period farmhouse in a conservation area and bordered by Bawburgh Lakes, near the village of Bawburgh five miles from Norwich in Norfolk. There are many activities to experience on site, but the property is an ideal location from which to explore the area whose attractions include The Sainsbury Centre with its art exhibitions and galleries and Sport facilities that include a swimming pool, a local golf course, a national cycle route and the Norfolk Broads and coast are only a drive away. Exterior of The Dairy, a single storey barn coversion. 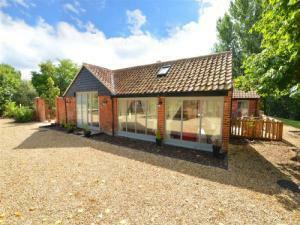 The Dairy, a converted barn on one level, is situated in the extensive grounds of Lodge Farm, a period farmhouse in a conservation area and bordered by Bawburgh Lakes, near the village of Bawburgh five miles from Norwich in Norfolk. There are many activities to experience on site, but the property is an ideal location from which to explore the area whose attractions include The Sainsbury Centre with its art exhibitions and galleries and Sport facilities that include a swimming pool, a local golf course, a national cycle route and the Norfolk Broads and coast are only a drive away.